Drop-in seat is a clamp-on, temporary seat for an extra paddler or optional seat placement. 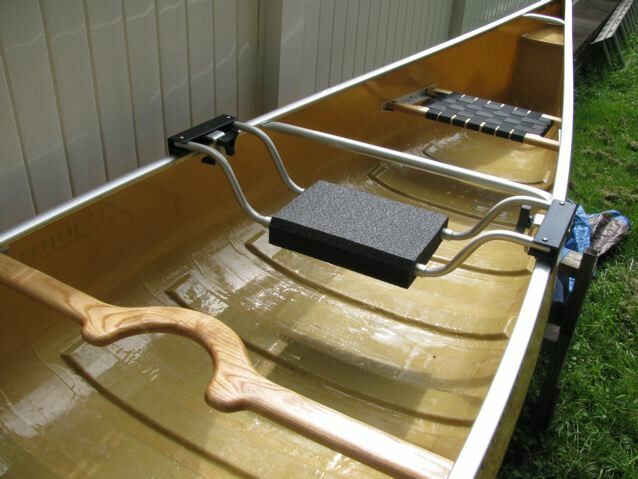 Adjusts in width to fit any canoe or placement, easily installs and removes without tools. I recommend the drop-in seat for paddlers who want to use an extra seat, but not regularly. An extra seat adds 3 pounds or so to the weight of the canoe, so if you will not use it very often, you can save the weight by using the drop-in seat. Compare this option with an installed “extra seat” option (with or without removable hardware). An installed extra seat is a bit more comfortable, easier to paddle and will not interfere with a car’s roof rack. However, it ads a few pounds to the weight, and has one fixed position. The drop-in seat is more flexible. It can be placed at any location. It can serve a third paddler, or a solo paddler, or even let someone sit facing backwards in the center of the canoe for conversation. I particularly like the Pegasus canoe set up with 3 seats plus a drop in seat. That allows you to use the full 4-seat capacity if needed, but also have room for more gear if that’s what you need on another trip.